"[M]ore than 5,000 Central American migrants [are] camped out at a sports complex in the border city of Tijuana," according to the Associated Press, most of whom arrived in a caravan from their home countries. Those third-country nationals are awaiting processing at one of the ports of entry between the United States and Mexico to determine whether they have a "credible fear" of persecution. There are three major benefits associated with keeping that caravan in Mexico while their claims are processed: economic, dissuasive, and diplomatic. Economic. A June 2018 article from CNBC breaks down the costs of detaining aliens in the United States. The least expensive aliens to detain are single adults. According to the network, it costs approximately $133.99 per day for U.S. Immigration and Customs Enforcement (ICE) to maintain one adult detention bed, although it notes that "immigration groups" have stated that that true cost is closer to $200 per day. It was my experience, as an immigration judge in a detained facility, that the lower figure is probably the more accurate, but I also note from my experience as a congressional staffer with jurisdiction over immigration detention that costs vary, and can be higher in certain areas. The cost of a family bed, in which parents and children are maintained in a family detention center together, is much higher. That figure is close to $319 a day, according to information that CNBC received from the Department of Homeland Security (DHS). The article notes that there are discrepancies with respect to how much it costs to detain a minor alone. It states that the then-policy of separating parents from children (to prosecute the former) led to the erection of so-called "tent cities". According to information that the network received from the Department of Health and Human Services (HHS, which has jurisdiction over such children, for reasons that elude me), the cost of beds in those facilities is $775 per night. With all due respect to HHS, I believe that this exorbitant cost reflects the fact that the detention of persons is not within the mission statement of the department, a point that I have made previously. Plainly, custody is a significant cost, although one that will likely save money in the long run by dissuading others from coming to the United States illegally. Those are the costs, but how large a population of individuals would have to be detained? The Atlanta Journal Constitution took a look at the caravan by the numbers in a November 26, 2018, article. It determined that there were 6,200 migrants in Tijuana as of Sunday, as well as an additional 3,000 migrants in Mexicali, a border city that is a few hours east of Tijuana. At the San Ysidro Port of Entry, the paper reported, 100 "asylum claims" were being processed a day, and 80 migrants were allowed into the United States per day. I would assume that a similar number of credible-fear claims are being adjudicated at the Calexico Port of Entry, across the border from Mexicali. The paper notes that it will take approximately six months to process all of the aliens in the migrant caravan in Tijuana. Four weeks ago, on October 30, the Washington Examiner quoted Roy Villareal, deputy chief patrol agent of the Border Patrol's San Diego Sector, who stated that only "about 20 to 30 percent" of the caravan consisted of families and unaccompanied children, with the rest being single adult males. This is consistent with a November 19 report from Fox News, which stated that DHS had revealed that "most of the caravan members are not women and children", but rather were single adult and teen males. Even MSNBC has stated that women and children "are the minority" of the caravan. Given the rigors of the trip to the United States, it is logically more likely that women and children would have returned home, rather than proceeding to Mexico. For purposes of my analysis, however, I will take the top-end number of 30 percent of the caravan consisting of women and children. Assuming that there are 9,200 migrants in the caravan seeking to make credible-fear claims, then 6,440 would be adult males, and 2,760 would be women and children. That would mean that the daily cost of detaining those women and children if they were all processed in the United States would be $880,440 per day, and the daily cost of detaining those adult males would be $862,895.60 per day, for a total daily cost of $1,743,335.60. It should be noted that that is a minimum figure, as it does not factor in that any of the migrants in the caravan are unaccompanied alien minors. Thus, the United States government saves almost $1.75 million per day in detention costs for each day that those migrants are in Tijuana and Mexicali. Under the Flores settlement agreement, and the president's current policy of not separating families, those women and children would be released in approximately 20 days, as I noted in a July 2018 post. Assuming that 80 percent of those 2,760 women and children would be found to have credible fear, the cost of detaining those women and children for 20 days to make asylum claims in removal proceedings would be $14,087,040. Assuming that 80 percent of the 6,440 adult males were found to have credible fear, 5,152 adult males would be placed into removal proceedings to make asylum claims. Assuming, again, that they were detained while making those claims, and factoring in that it would take between six weeks and three months for those claims to be heard, the cost of detaining those 5,152 adult males would be anywhere between $28,993,292 and $62,128,483. Therefore, if the caravan remains in Tijuana and Mexicali, the United States government would save anywhere between $43 million and $76 million in detention costs, at least in the short run. It should be noted that this figure does not include the municipal and social-services costs that states and localities would incur in dealing with these new, additional residents if they were to be released. Moreover, if 80 percent of those 9,200 migrants (7,360 migrants) were to be admitted to the United States at once and detained, it is likely that an equal number of currently detained aliens would have to be released. The Atlanta Journal Constitution notes that 39,322 aliens are in detention on an average day, so approximately 19 percent of currently detained aliens would have to be released. Dissuasive. This means the benefits that would accrue to our immigration system if future migrants were deterred from coming to the United States. The reason why these migrants have come to the United States in a caravan is that it has been effective, at least as far as making it to the border. 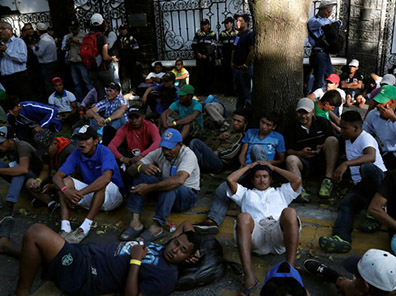 If future migrants considering coming to the United States in a similar manner were to be aware that it could take up to six months for their credible-fear claims to be heard (the figure quoted in the Atlanta Journal Constitution for the amount of time that it will take to process the migrants in the caravan in Tijuana now), it is much less likely that they will come. In addition, at least some of the migrants in the caravan would be likely to return to their homes, as at least some have decided to do. According to a November 27 report from the Associated Press: "There was a steady line Tuesday outside a tent housing the International Organization for Migration, where officials were offering assistance to those who wanted to return to their home countries." Again, logically, these would be the migrants with the weakest asylum claims, given their willingness to go back to the country from which they came. This is well in excess of the almost $181 million in aid that United States gave to Honduras in FY 2017, the $257 million it gave to Guatemala that year, and the FY 2017 total for El Salvador of $118 million in aid, but is likely just a starting point for negotiations. This is particularly true given that $20 billion would be more than 6 percent of Mexico's budget expenditures, which the CIA World Factbook estimated at $314.9 billion in FY 2017. In all, there are significant benefits that will accrue to the U.S. Treasury, and to our immigration system, if migrants claiming credible fear are required to await processing in Mexico. The status quo should remain.